That is so cool! You must be a cool mom. I am not sure if I could handle 10 kids together. Happy birthday wishes to Medha. That is a beautiful name. Gini, thank you! I will let her know. 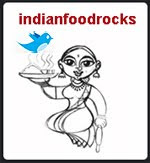 We are taking her out for dinner to a new South Indian restaurant that has opened in Boulder to have idlis. I have been unsuccessful with idlis since we moved here so this will be a huge treat for her as idli is her favorite food! I hope we find the place because I just have the name of the restaurant and the general location. 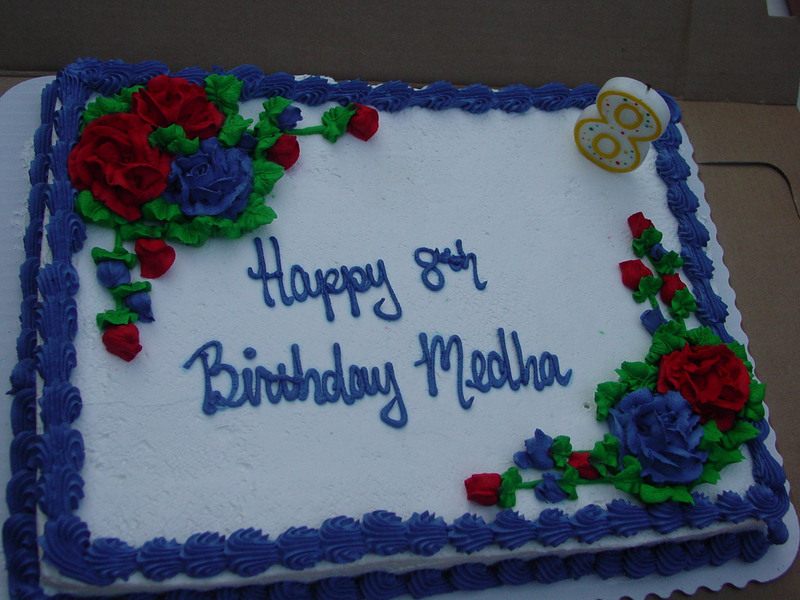 Loads of birthday wishes to Medha. Happy Birthday Medha !! Seems like you had lot of fun. That sounds like a fun party. Shilpa, you got it right! Oh! To be a child again! Shankari, it was a lot of fun! Tiring though, because 10 kids can be very demanding! Mika,truth be told, it was the easiest kids party ever! Like I said, I woke up kind of late. Some of the kids were invited as late as Tuesday for a party on Saturday. Invitations were mostly verbal but then since most people needed the address, we mailed out invitation cards as late as Tuesday. I could have emailed the address too but there are some folks who don't check email for days. The cake was ordered on Tuesday, too. In the worst case, I would have gone and picked up any old half sheet there was at Sam's on the day of the party. The food was very simple, too, and only needed chopping or mixing and then laying out in platters. I started on the food well past 4 pm on the day of the party. Grilling the hot dogs wasn't much of a problem either. Only the grill was! That was the sole hitch we encountered. One of my friends gave me her tent, another kid's Mom handed me theirs as I was extending the invitation and the third tent was hoisted over the fence from one yard to another. I did not worry about return gifts either: the hula hoop was the return gift. I got them a couple of days before the party. I had to make a trip to two Wal-marts to get 10. Glow sticks were 88 cents a piece. And we used only a few of the the flashlights, which were 84 cents a piece. I had no structured activities like crafts or games planned. They came, they ran through the sprinklers, screamed, hula hooped and had fun. We were there to make sure they were safe and to diffuse difficult situations. We had one girl leave the party very upset because of an altercation with another girl. As she left I told her she was welcome to come right back if she changed her mind, no matter what time it was. Or even for breakfast the next day. She was back in less than half hour with big smiles on her face. She was 'best friends' with the girl who had offended her earlier and together, they proceeded to have the time of their lives. 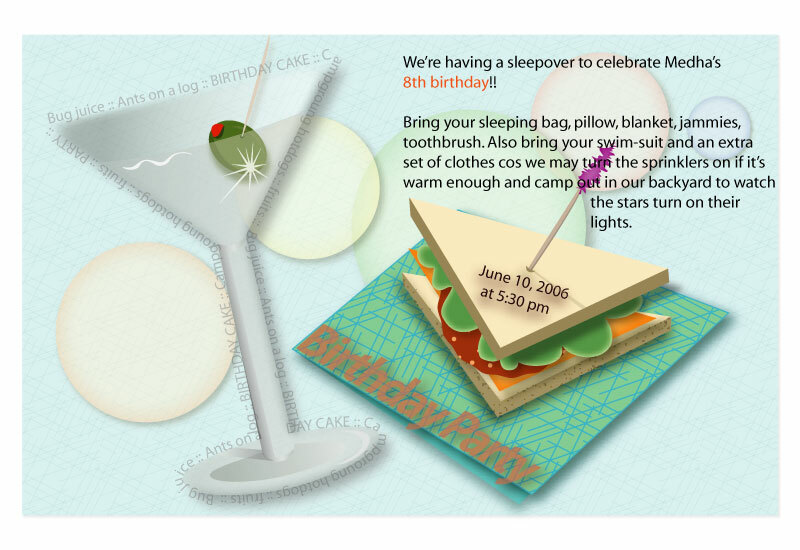 If you have kids, this is a real fun party as they feel like they have gone camping, with all the comforts of home. There is such a thrill associated with sleeping outside in the open! The initial plan was to watch the stars come out and then head inside to sleep but that would have been too much of a pain with 10 kids. So I checked with each parent as they dropped their child off and no one had any issues. So they all slept outside and all in all, it was a huge success. Now that I have endured this, I will do it again many times through summer but with a small group of girls - at the most 4 or 5. And, of course, the chivalrous young man from next door. What would we do without him?! WOW!!! U all must have had an excellent time. Happy belated b'day to Medha. What a great write-up. I just loved it. Sounds like it was a great party! We were talking about baby names on Sunday for a friend who is expecting and I brought up the same name, Medha. I have always loved that name. Happy birthday to her! 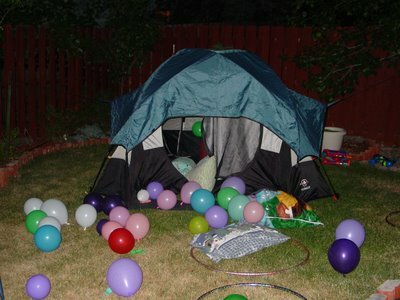 Whenever my daughter asks for camping in the backyard with her friends, I set up everything in the living room and let them camp there. LOL I am a scaredy cat! Please convey my birthday wishes to the little one. A happy birthday to your daughter - it sounds like a grand time was had by all. I didn't really see this post until today, Manisha, thank you for being this kind to me, you have always been that way from the very begining of my blog. Belated happy birthday to Medha. A very interesting write up !!! Pushpa, great time was had by all. RP, we had a trial run in the neighbor's yard the previous night. That gave me some confidence. Also, my backyard is completely fenced in. And, I slept on the sofa in the living room with the patio door open. You could always do it with your kids so you are out there with them. Linda, welcome to IFR! Medha has expressed a desire to post a comment thanking you all. I hope to hold her hand through that some time soon! Thank you for the wishes! Archana, you are blessed with a talent so wonderful, something the rest of us can only dream of! Thank you for letting us peek into your world from time to time. God bless! I tried your vangi bhaat recipe today... it was really good. Thanks! Maya, welcome to IFR! I'm glad you liked my vangi bhath. Did you use goda masala or did you substitute it with something else?